built into the chassis. The cameras in the Toshiba Encore 2 Write have significantly improved over the Encore 2, now with a 8MP rear facing camera and a 1.2MP front facing camera. You still have the 802.11n Wireless connectivity which support Miricast, Bluetooth 4.0 and up to 11 hours of battery life. The TruePen stylus of the Encore 2 Write is designed to allow you to ink up images, sign PDFs and other things that a touch pen is a bit easier than doing it with your finger. This will be particularly true of the 8″ display unit where pen touches can be a bit more precise. 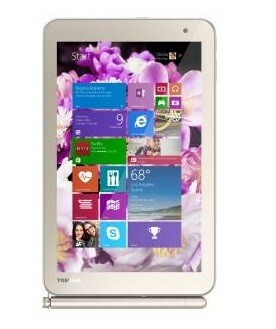 The Toshiba Encore 2 Write 8″ model is $349 at the Microsoft Store while the 10″ model is $399. Both come in a white and gold finish, just like the Encore 2. They also come with a year of Office 365 Professional which gives you unlimited cloud storage on OneDrive. Both are really a good value for what they bring and certainly should be a consideration for those looking for a budget friendly Windows tablet.